I’m sure everyone has already heard that JK Rowling has let slip that her beloved secondary character in the Harry Potter books, wizened wizard supreme Albus Dumbledore, is in fact a beans-n-franks sort of fellow. What does this all mean? Does it mean anything? Some gay rights supporters are claiming it’s a positive sign of support for their cause. 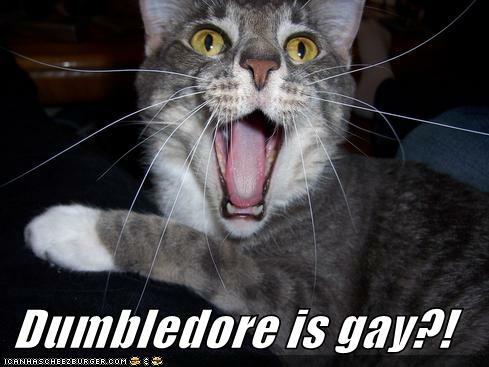 Other gay rights supporters are claiming it’s a shallow and cowardly sign of support for their cause, because nowhere in the books does dear Albus explore his taste for dangly gonads. Some fans are considering whether this revelation explains Dumbledore’s fascination with winsome young Harry; see this photo, if you dare. Some anti-gay rights people are claiming such “controversial” sexuality has no place in a children’s book. For them, though, this is all par for the course, since the Christian Right has long since been opponents of Rowling’s universe, which normalizes witchcraft and other such “Satanic” activities. I’m surprised that no one has suggested an untoward relationship or advances between Dumby and Voldemort being the cause of the latter’s downward spiral; seems an obvious take on the current rash of abuse allegations affecting similar religious-themed private schools. 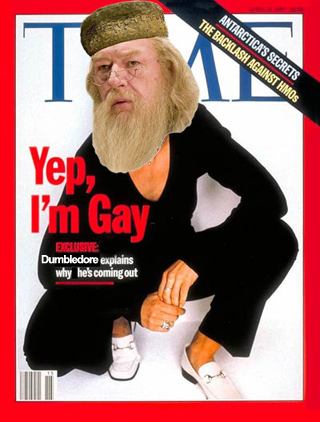 The most reasoned take on the “controversy” that I’ve heard so far is that the fibre of the stories themselves prevented any discussion of Dumbledore’s sexuality. The books are about youth, told from their perspective. To them, the adult world is one of mystery and foreboding. Dumbedore in particular is a character of great mystery and intrigue. It is natural that these more personal aspects of his life –perhaps closeted– would contribute to his aura. My take is an authorial one. In my last book, I had two homosexual characters who weren’t overtly so. Their sexuality was in no way relevant to the story or to their characters. But I envisioned them, as I do all my characters, with full life histories and emotional palettes. Thus, their sexual orientation flavoured their actions, but was never explicitly expressed. If Rowling is anything like me, then she did the same with Dumbledore: it is how she thought of the character, her creation; thus it was irrelevant if she actually explicitly mentioned his penchant. But feel free to insert your own joke about “magic wands”. The Other Ray sends us this story about new developments in astronaut food… farming insects!